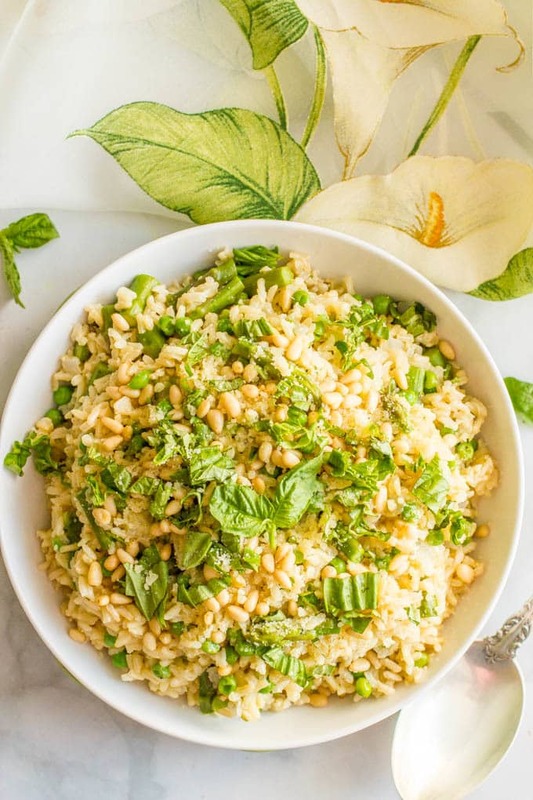 One-pot spring rice pilaf with asparagus and peas is a bright, fresh and easy side dish that’s topped with Parmesan cheese, fresh basil and (optional) pine nuts! Hiya friends! 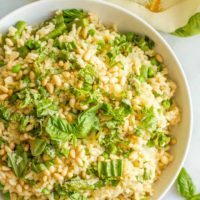 So I know we are unofficially into summer but I just couldn’t let the last days of spring go by without sharing this recipe! All the freshness and all the lightness we want this time of year and still all kinds of delicious. And so easy! Plus, this side dish goes great with so many dishes – grilled or baked chicken, roasted fish or pork chops. It would be super yummy with my 3-ingredient easy balsamic pork tenderloin too. 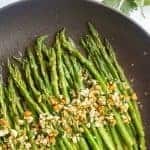 You need to get the slender thin asparagus for this. Those huge thick stalks won’t steam up quickly enough in the pot during the end of the rice cooking time. If all you can get are the big stalks, I’d suggest steaming or sautéing them separately, until tender, and adding them in at the end with the peas. 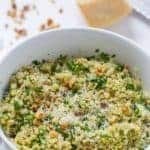 Parmesan cheese, or at least a hard Italian cheese, for serving is kind-of a must here in my opinion. 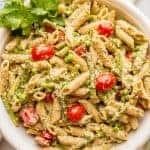 However, you could use nutritional yeast to make this vegan. Don’t skip the basil either. 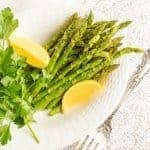 It adds such a great hit of freshness at the end and pairs so well with these veggies. Pine nuts, however, are optional. 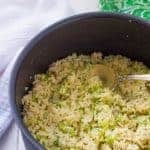 I’ve made it both ways and while they add a great nutty flavor and a good crunchy texture on top, the rice pilaf is delicious even without them. They can be super expensive, so don’t feel like you have to buy them just for this dish. I especially love that this can all cook together in one pot. Not only is it easier clean-up, but it helps the flavors meld and just brings the dish together! 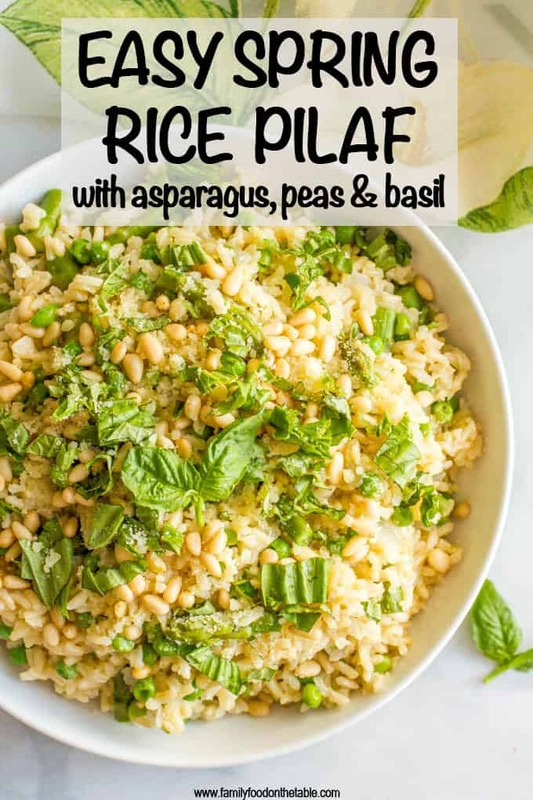 Oh, and lastly, we are a brown rice, whole grain loving family here but if you prefer white rice, you can still make this dish! Add rice and stir to get it mixed with the onion and coated in the oils. Add vegetable broth, bring to a simmer, then cover and cook for 20 minutes. 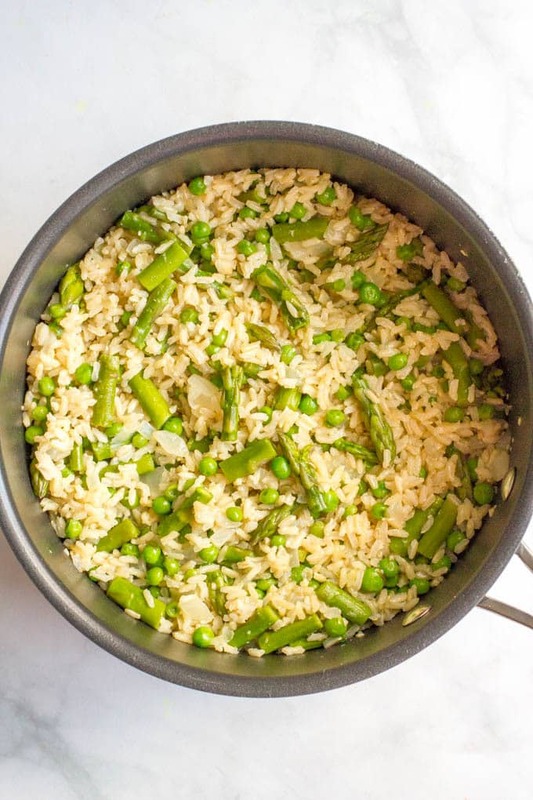 Add trimmed asparagus on top of the rice in the pot then cover and cook another 10 minutes. Uncover, add peas, then turn off heat and let sit, covered, for 5 minutes. 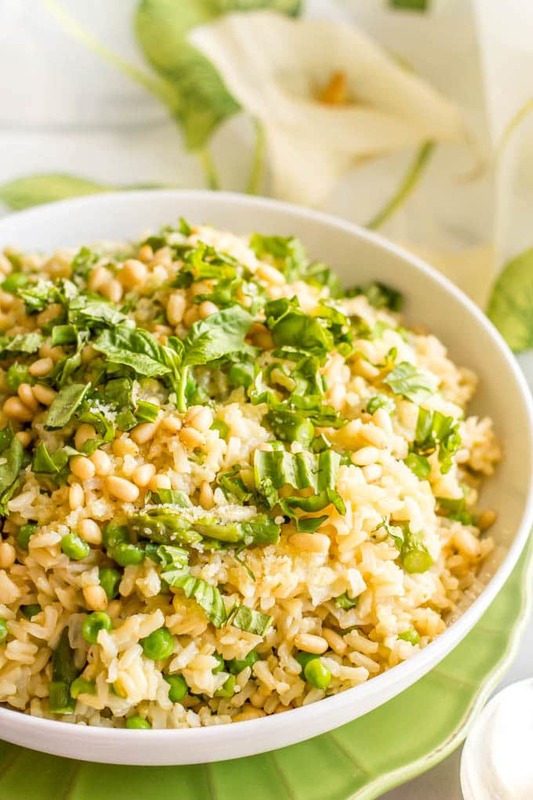 Stir peas and asparagus into the rice and season pilaf with salt and pepper to taste. 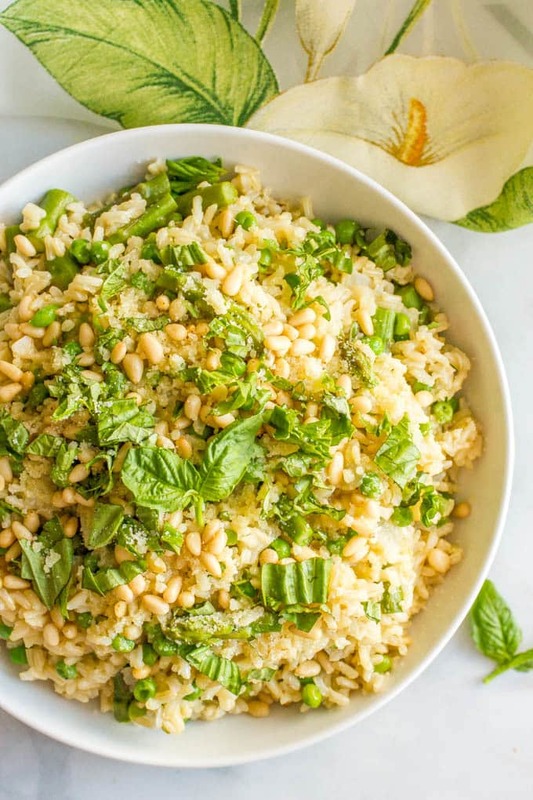 Serve garnished with Parmesan cheese, pine nuts and basil. You need to get slender asparagus for this. Those huge thick stalks won’t steam up quickly enough in the pot during the end of the rice cooking time. 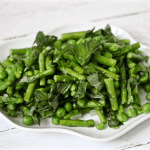 If all you can get are the big stalks, I’d suggest steaming or sautéing them separately, until tender, and adding them in at the end with the peas. I somehow totally missed out on asparagus this year! This is motivating me to go on the hunt for the last bit that’s left for the spring to eat this weekend! This looks amazing! 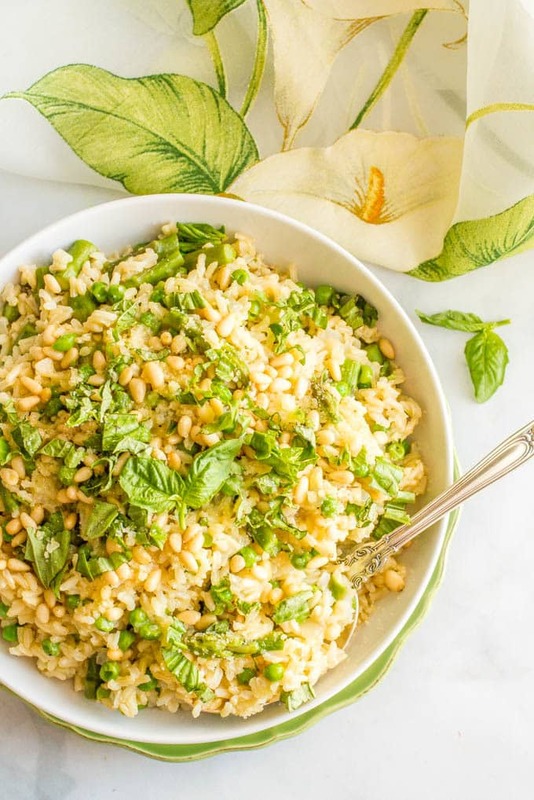 Love the combination of asparagus and peas, such great light spring flavors! This sounds just so good! Down here in Florida I feel like it’s already been summer for months, so it’s nice to think of something besides summer food (I know I’m a little early to be wishing for cooler weather again). Oh well.